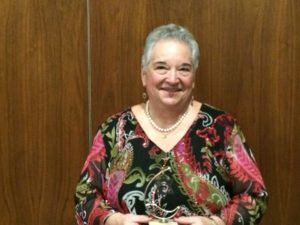 Rochelle Lafer was honored on December 3, 2015, when she received the 2015 Bobbe Karpay Woman of Distinction award. Rochelle has been an active member of Beth Israel since moving to Sun City Center in the fall of 2011 and currently serves as Sisterhood president. She has also been a member of the ritual committee and ways and means committee since 2012. Rochelle served as Sisterhood programming vice president from 2012-2015. In addition to her involvement with Beth Israel, Rochelle has been active with the Chai Chapter of Hadassah. She served as secretary from the creation of the chapter until 2014 and currently is the vice president of education. Rochelle has been the secretary on the board of directors of the Oakley Green Condominium Association since January of 2014. While teaching at the Spence-Van Etten Central School, she served as president of the Teacher’s Association from 1978 to 1981. From 1972 to 1982 Rochelle was an instructor for the Ithaca Dog Training Club and coordinated the Tompkins County 4-H grooming and handling program. She served on the Board of Directors of the English Cocker Spaniel Club of America from 1975-1977, and was show chairman for the national specialty show in 1976. Rochelle was involved with the Jewish Community Center of Broome County, New York, serving as chairman of the preschool renovation committee from 1989 to 1991 and as a member of the capital campaign committee in 1992. While her four children attended Hillel Academy of Broome County, Rochelle was president of the PTF from 1992-1997, chairman of the board of education, a member of the board of trustees, and co-chairman of the journal fundraising campaign for ten years. In 2003 she was awarded the A.M. Pierson Memorial Award, the school’s most prestigious award. At Temple Israel of Vestal, New York, Rochelle served on the board of education and as a trustee. Rochelle and her husband William have been married for 33 years and have four children.